Here is a thoughtful Christening and Baptism favor to bestow to your family and friends with blessings of love! 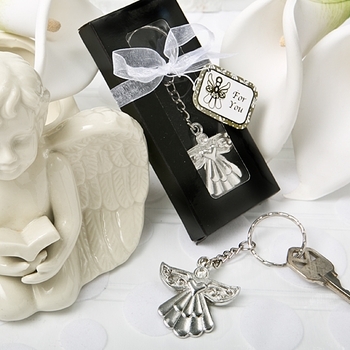 Beautiful and practical describes this all metal key chain featuring a classically shaped angel with wings outstretched and a heart in the center. The angel measures 1 1/2 inches tall and wide and 3 3/4 inches long including the chain. Each comes packaged on a black felt stage in a black gift box with a clear display top. It is then adorned with a gossamer organza ribbon and a coordinated gift tag that says �For You� on it. You can also add Personalized Tags or Stickers to your order ($.35 each favor) if you would like to add a little personal note to each key chain gift box before giving to your guests!